Indentification of this design as number 120 is original to Rakusan who designated this woodblock print as the 120th design published in his main sequence. However, 120 is actually the twentieth of thirty-six woodblock prints in Rakusan's second main sequence series, 篁子生画選, Koushisei Gasen, lit. 'Koushisei's Print Selection' (usually called here the 36 Series). The woodblock print of 120 was adapted from an actual-size original painting on silk. All of the original prototype paintings for this series are currently in a single private collection. The color palette of 120 is unusual for the 36 Series in that so few colors are represented, only white and yellow with grays. Like most 36 Series designs 120 has the same signature and seal combination on every copy. Therefore, for 120 only a single extended edition I (which includes reprintings both before and after World War II) can be distinguished. It is usually only possible to date an individual loose print of 120 with edition I markings by listing approximate potential ranges of 1934-1941 and 1948-1955. The Rakusan project which produced 篁子生画選, Koushisei Gasen, resulted in two related series of woodblock prints. Each print of the 36 Series is intimately connected to a group of prints with the same subjects in the Fan Series. Together these subject-related prints in the two series constitute a theme. Each theme normally consists of a quintet of monochrome Fan Series designs (one design in each of the five fan shapes), plus one polychrome, 36 Series design which illustrates the theme subject. The theme is labeled here by the original Rakusan number of its 36 Series design followed by the subject. 120 is the 36 Series design of the 120 Tea Flower theme. All three themes 119, 120, 121 of installment seven have irregular numbers of Fan Series designs. As a result of a late decision to merge two incomplete themes, Rakusan was left with eight Fan Series designs in theme 121. Making the installment quota of fifteen designs in three themes meant shorting the other two themes in installment seven. Normally Rakusan would have infilled the missing Fan Series designs in all four original themes with seal B designs just before publication. However, the solution he adopted here meant that no Fan Series infilling was necessary. The 120 Tea Flower theme has the fewest number of individual designs of any theme. Its three Fan Series designs are two short of the normal quintet, and the theme is lacking fan shapes 1 and 2. The 36 Series design 120 and two of the three Fan Series designs in the 119 Nandina theme have seal C which indicates carving dates between the last months of 1933 and the end of the first quarter of 1934. The remaining Fan Series design is the only known example of seal I. Here seal I is interpreted as a (perhaps accidental) variant of seal H which is a minor seal during the seal A period and would have been carved earlier during the third quarter of 1933. It is probable that 120 was adapted from sketches originally created in the late 1920s for design 61 of the earlier 100 Series (see below). 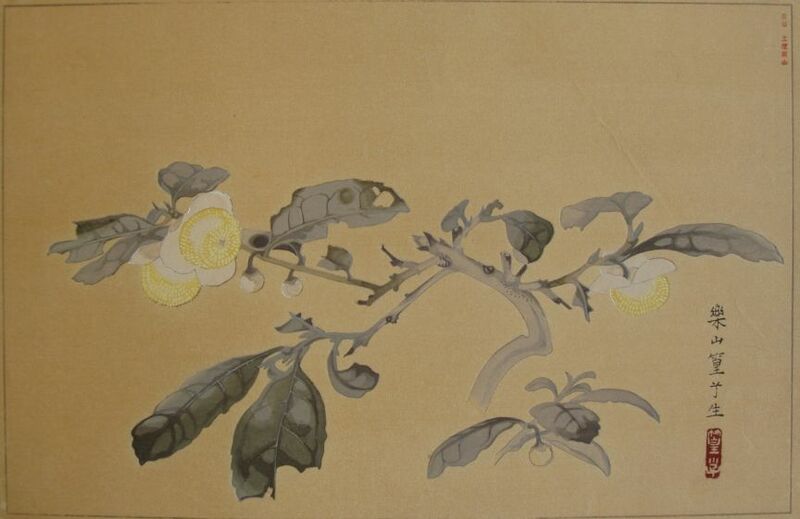 Tea, Camellia (Thea) sinensis, 茶, cha, is an originally exotic shrub which is now a common agricultural crop in Japan. Its leaves are harvested to make various kinds of tea. The closely trimmed plants are often supported by bamboo stakes as shown in 61. Tea plants typically flower in winter.